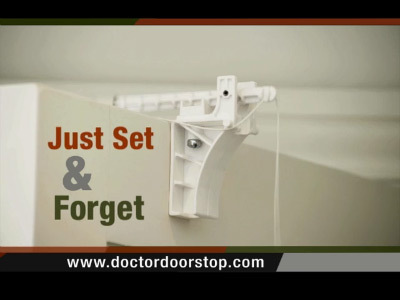 Doctor Doorstop is the only automatic door holder you just set and forget. There's no installation required! Just place it anywhere on top of the door frame and the safety arm automatically drops into place, holding the door open to your desired width. When you want the door closed, simply pull the cord and raise the arm. Re-open the door and the arm drops back into place. Just set it and forget it! Doctor Doorstop prevents serious injuries to hands and fingers when your little ones or pets are running in, out or around the house and keeps them from locking you out in any situation. It fits most standard doors and once placed it never needs to be moved again. No more accidental closure of self-locking doors! Also, it conveniently ends the struggle when lugging an armful of groceries, and you can even take Doctor Doorstop with you to help make business deliveries a breeze! The versatile Doctor Doorstop can prevent damage to paint and wall paper when leaning heavy objects against a wall (i.e. sheets of plywood), hold utility lights when painting a room, will keep extension cords from getting jammed in the doorway, or serve as your personal valet to hang suits or dresses. 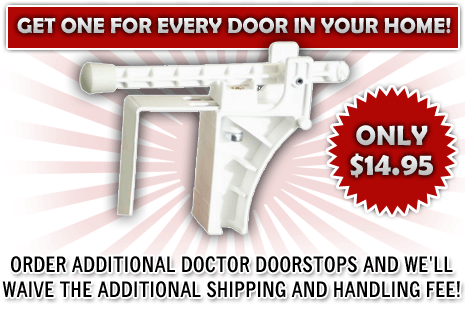 No more stubborn rubber door stoppers or greasy hydraulic holders that slip—Doctor Doorstop slides right onto any door wherever and whenever you need it! Copyright © 2019 Doctor Doorstop, LLC. All rights reserved.